On the second last night of the conference, a banquet event was held at the nearby Sea World. Despite the park being mostly closed for the night, we were able to see the penquins! These creatures are so clumsy on land, but so majestic when swimming in the water. 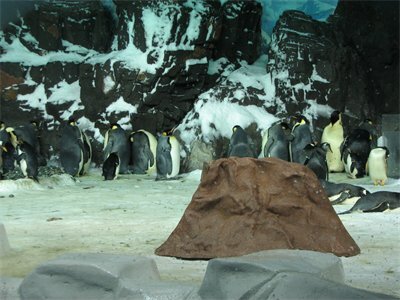 The penguin area is climate controlled to simulate their native southern hemisphere. Even the lighting is apparently controlled to go on and off as the sun rises and sets. 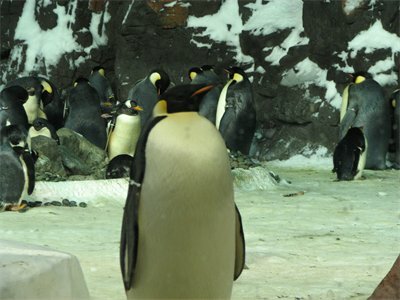 At the back, you could see a rarer variety of penguin best known for being “fatter” than the others. 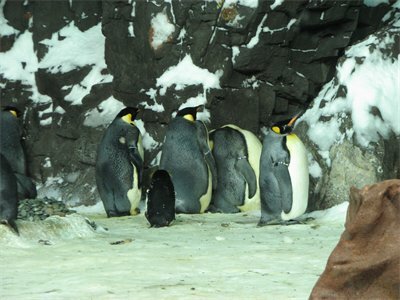 While other penguins can be seen in many places, this type can only be seen in three places on earth: San Diego, Australia and of course Antarctica. Interesting indeed! This concludes my series of photos for San Diego. I hope you enjoyed them. 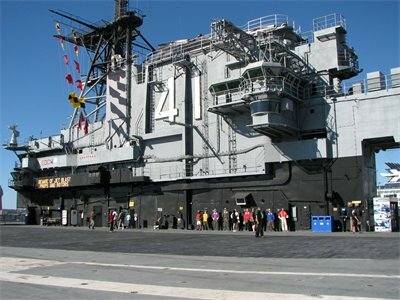 On one of the days before the conference, I decided to visit the USS Midway, a floating museum. 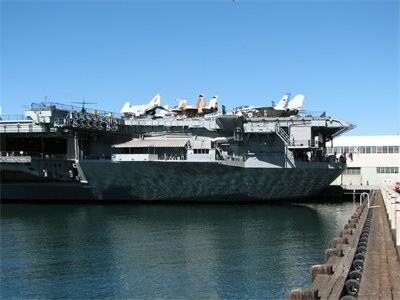 It was in use as an aircraft carrier right up until the 90’s. This is a portion of the ship, on top of which you can see various aircraft. 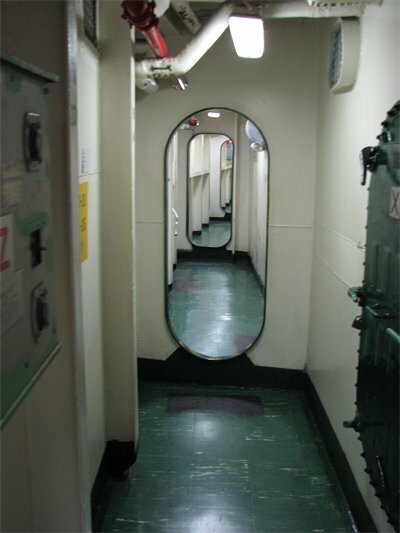 Inside the ships, every single doorway is raised above the floor somewhat. I assume this is to prevent minor flooding from becoming a major problem! That’s a lot of controls! 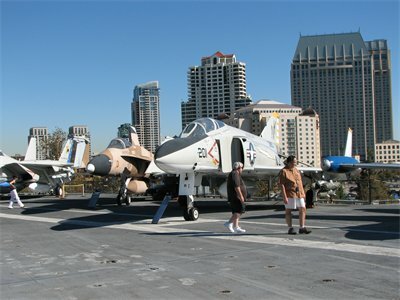 On top, you can see the aircraft up close, and the San Diego skyscrapers in the background on shore. The control deck is rather huge on top. 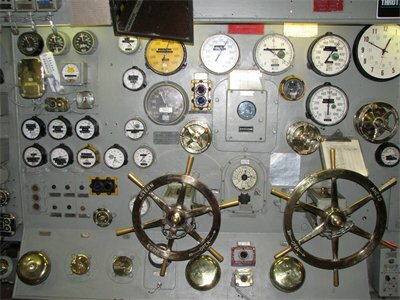 I took many photos inside the ship, far too many to post here. 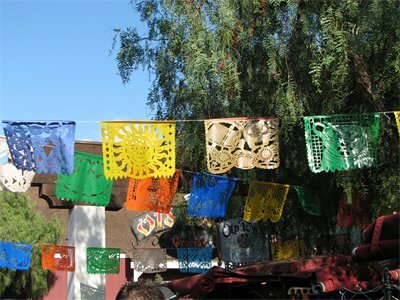 For the first day of the conference, I went to Old Town for lunch with a bunch of ILab students, past and present. This is the entrance to a market which sells all kinds of things for tourists. I bought a couple of stupid items. One is a small wooden box where a snack comes out of a hole when you press a button. Another is just a plastic eye enclosed in a plastic covering that always looks upwards! Me and the group sitting at the table. At the very centre of the photo is Nic from Germany, who helped me write a post card to my grandmother’s sister in Germany! I usually write her in English and she gets relatives to translate for her, but this time, it’s actually in German! Yet another picture of a shop’s wares that I didn’t buy. 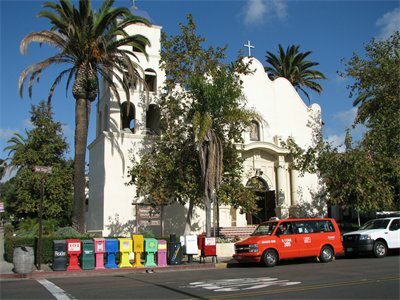 A church surrounded by palm trees, and every coloured newspaper box you could imagine. 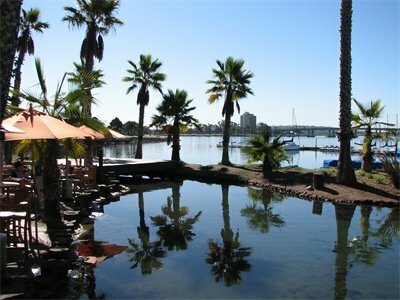 Mission Bay is where I spent the majority of my time in San Diego. The hotel where I was staying, Paradise Point, is located across the bay from the Hilton, where the conference was taking place. 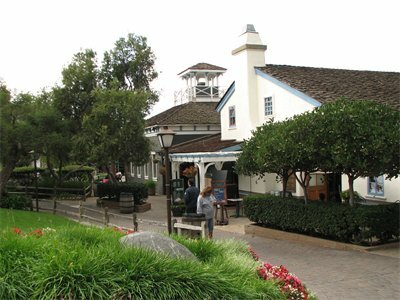 Paradise Point had a nice location, but it’s lack of any extras makes it hard for me to recommend to anyone. Outgoing toll-free calls and internet usage all require fees on top of the already expensive room rate. The name isn’t a huge misnomer though. The place does feel like paradise, at least it might if I actually would’ve had lots of time during the days to use the facilities. I don’t really have any decent pictures of the Hilton grounds, though I did decide to get a bit creative with my camera in my spare time between sessions. 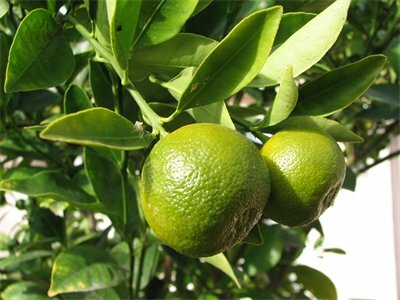 This image is a close-up of an orange tree. 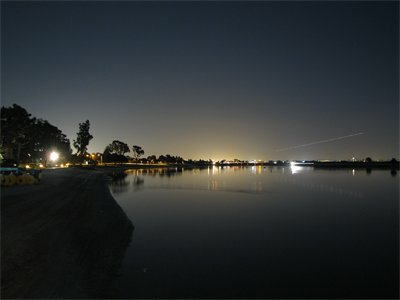 Mission Bay at night is quite beautiful when using a long shutter speed. The line of light in the sky is a plane. 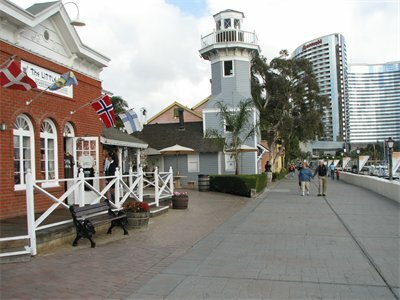 On San Diego’s waterfront is Seaport Village. 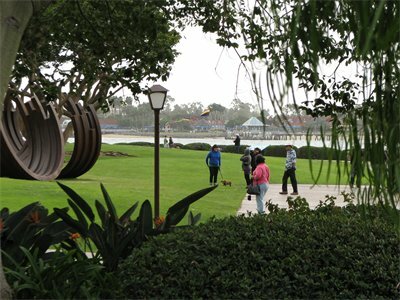 This “village” is a popular tourist destination occupying prime waterfront property in San Diego. 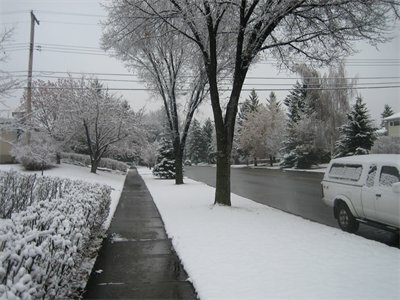 It is designed to be a “car free” zone where foot paths, not roads, connect the various shops. 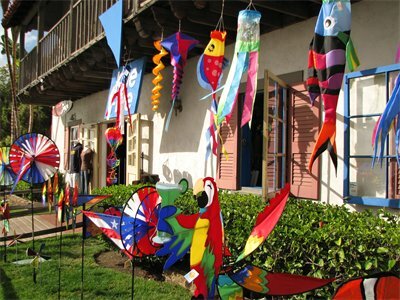 It’s a good destination for any tourist looking for gifts and other things. This is a shop selling lots of colourful things. This area has some history. Back in 1782, the Spanish buried those who died of scurvey here. Years later, the area was used as a landfill and also a rail yard. Nowadays, the waterfront is very well developed with high rise hotels acting as a backdrop. It’s a much better use than a landfill would be! That’s all for now. Feel free to leave comments! 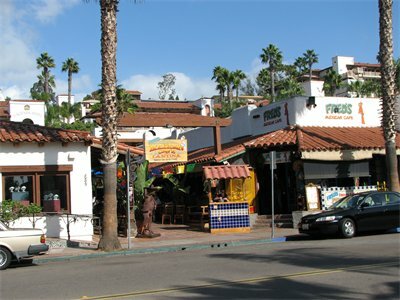 Arriving on Wednesday, I am currently in San Diego. I have been flown here by school to attend the CSCW 2008 conference. This is San Diego in winter. Just kidding. 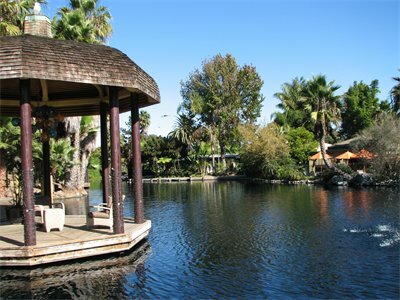 This is spot near my street on the morning of my trip to San Diego. 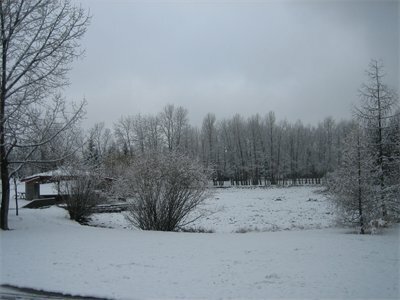 The first snowfall of the year sits fresh on the ground. 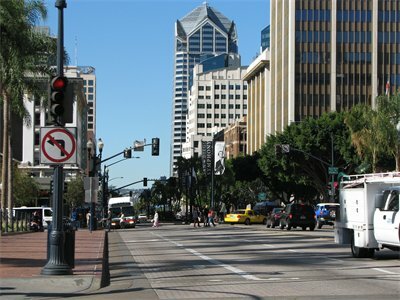 This is downtown San Diego the day after I arrived. 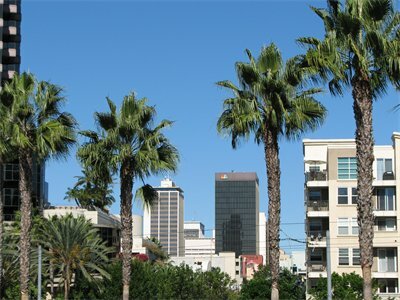 Tall buildings and palm trees are everywhere. It was very hot, almost too hot for me since I’m not used to the heat. 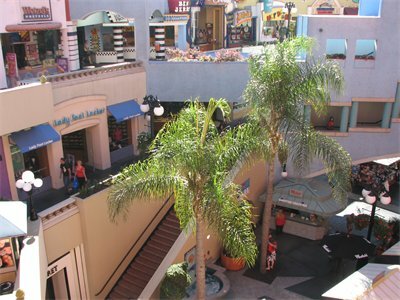 This is Horton Plaza, one of San Diego’s popular outdoor malls. The warm climate allows many malls like this to exist where there is nothing enclosing the mall itself, though individual stores do have traditional doors and enclosures. The mall is actually a bit confusing to navigate, compared to Market Mall in Calgary or McAllister Place in Saint John. 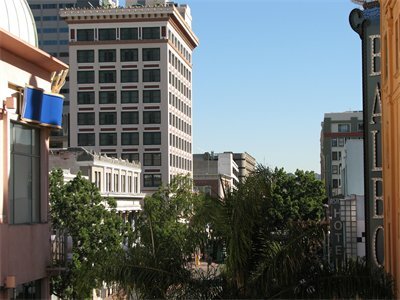 This is a view of downtown from Horton Plaza. Trees are everywhere. 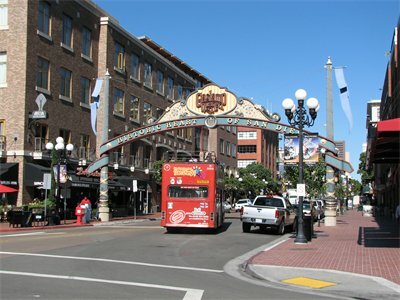 This is a view from San Diego’s Gaslamp Quarter, the main area for restaurants and clothing stores. Gaslamps are still used, though more modern street lights actually light the area. The NBC San Diego building is off in the distance between several palm trees and hotels. 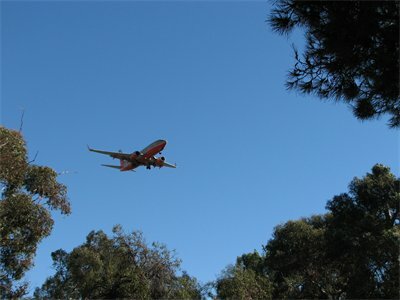 Since the airport is not far at all from the downtown, planes are often seen flying very low. I took this shot standing in Balboa Park. I was a bit surprised to see planes so low in a large American city after 9/11. 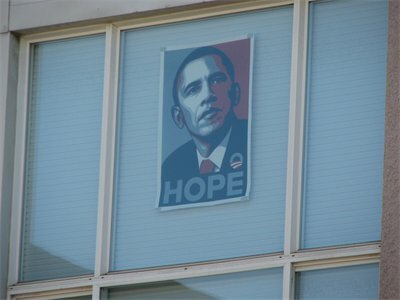 Despite the election being over, materials supporting Barack Obama are still everywhere. I even saw an image similar to this one on someone’s T-shirt. That’s all for now. I’ll post more photos from other locations besides the downtown shortly.